From traditional turkey or chicken to pheasant, Cornish game hens, quail and duck, golden roasted birds are a simple, delicious way to celebrate. It’s that time of year when we get overwhelmed. Not with cooking and cleaning duties, mind you—but with wacky suggestions for getting the bird to the holiday table. We’ve got one friend who’s disconsolate year after year because we refuse to make her turducken-on-steroids recipe: a quail inside a game hen inside a chicken inside a duck inside a turkey, all coated with thick rounds of mushroom this and liver pâté that. It’s hard to even know where to start with what’s wrong with that—but there is definitely something unappealing about trying to shove four birds into one turkey. And our other friend insists we try her turkey-in-a-slow-cooker marvel. She plops a boneless breast inside, adds a jar of plum preserves and a can of cream of asparagus soup, and voila: eight hours later, the white meat is so tender it’s more like glazed sand. Really, there’s no need for all this nonsense. Roasting birds is one of the kitchen’s easiest and most simple pleasures. Maybe that’s why a turkey is customary for the holidays: the mere sight of a golden, juicy bird is enough to put anybody in a celebratory mood. 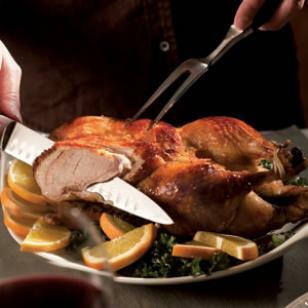 Plus, succulent and tender birds are exquisitely easy to prepare. Although most of us think about turkey this time of year, there’s no reason to stand on ceremony. Yes, a roasted chicken is a thing of beauty any night; but set atop a rich stuffing and roasted until crispy brown, it’s darn near irresistible at any holiday meal. But why stop there? A roasted duck for Christmas Eve fills your house with tantalizing smells, offers a creative change from the usual and guarantees succulent meat every time. Or how about quail with a brown-rice pilaf? Quail is easy to cook and surprisingly rich, all dark meat with lots of deep flavors; it also pairs well with beverages from champagne to beer. There are other birds to consider as well. We all know chicken and turkey are low in saturated fat but Cornish game hens are too. Their flavor is like ultra-rich chicken, thanks in part to the way the roasting bones permeate the meat with their taste. Pheasants are richer-tasting than game hens and since you rarely see them except at fancy restaurants you’ll definitely surprise and impress guests when you bring one out. And a single pheasant roasted with vegetables makes for a beautiful holiday meal for four without mind-boggling amounts of leftovers. Keep this in mind when you’re planning your holiday menu: in general, the bigger the bird, the longer the time in the oven. So if you’re up for an all-afternoon cooking event, go for the turkey, but when you have an hour to get a festive meal on the table, smaller quail or pheasant is a better option. Birds are a part of our holiday tradition—and we hope yours too. Put away those crazy recipes with every gimmick in the book. Come back to the basics and roast these birds. Contributing editors Bruce Weinstein and Mark Scarbrough’s most recent book is The Ultimate Cook Book (William Morrow, 2007).